In May we had the opportunity to journey through Europe with our good friends the Astons, and were able to hit one of my long awaited bucket list spots! ICELAND. I'm so excited to share with you how we visited Iceland in five days! It's no secret that Iceland has become one of the biggest tourist stops, especially among photographers, and I've received countless questions about what we saw and suggest! We stopped in Iceland for only FIVE DAYS and we packed the trip with lots of amazing sights and scenes. Technically we were there for six days, but with our flights landing late and leaving early, we had about a full five days for activities. So let's dive right in! I'm so excited to share with you How to visit Iceland in Five Days! Our first day we landed at the Keflavic airport and headed straight to the Blue Lagoon. Though the tickets seem pricey, it is WELL worth it! We loved swimming in the Blue Lagoon after our flight from Amsterdam. This was all we did our first day as we flew in late that afternoon, and it was the perfect start to our trip. We woke up early and left Reyjavik and drove out to Glymur Falls for a hike. I had heard of Icelands crazy weather, but this was one of the craziest experiences- we started with extreme warmth, then were continually hit with waves of white out blizzards. It was incredible! Glymur Waterfall was one of the most beautiful things I've ever seen, and definitely one of my favorite things we did this trip. It can't be missed! After the falls we hopped back into the car and roadtripped up to Londranger and Kirkjufell. While Kirkjufell is beautiful, it's definitely more of a tourist spot. Londranger had my heart for sure, it was Iceland's version of Big Sur. We headed into the Golden Circle and hit a few touristy spots- drove to Geysir, a gorgeous crater lake, then to Gullfoss. 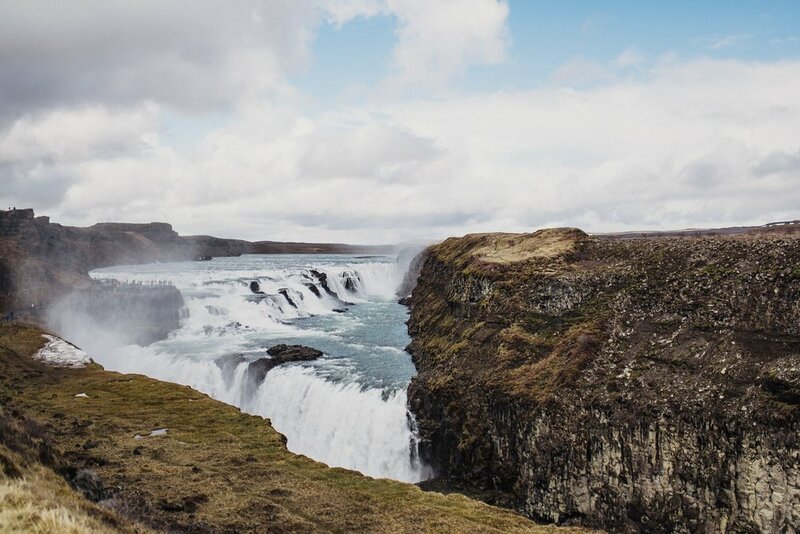 Gullfoss is another tourist trap, however I highly suggest it- it's beauty can't be understated. After that we headed to Hveragerdi to the most INCREDIBLE hike through a valley of geysirs and rolling hills, to swim in a stream from the hot pots. This is easily my favorite part of the trip. As we visited in May, we hit it right at a warm season (warm for Iceland, anyway) but before it was overrun with tourists. After swimming around for a few hours (Aka just lounging. It was amazing.) we headed back into Reyjavik. We ate at a little bistro called Gló which had incredible Vegan + Gluten free options, then found a little dessert place called Joyland around the corner. We had the most amazing Gluten Free Crepes and Brownie Icecream Sandwiches. If you're gluten free or vegetarian in Iceland, I highly suggest stopping by these places! Drove to Seljalandfood and Skogafoss- both were absolutely incredible and grand. They're very close, and worth taking the time to see individually! After walking around the two waterfalls, we headed to the Black Sand Beach. This was one of the most anticipated parts of our trip- I've been dreaming of seeing and photographing Black Sand Beach and it did not dissapoint! It, however, was ABSOLUTELY FREEZING. Do not underestimate Icelands weather, especially when combined with wind. Regardless, it was an absolute dream! After that, we headed to our Airbnb on the cutest little farm outside Kirkjubæjarklaustur. We left our Airbnb and drove out to Diamond Beach and the Icebergs. This was such a surreal experience! Iceland truly is like being on another planet- one minute you're driving through fields, the next you're surrounded by glaciers. The drive to Diamond Beach is definitely long but is beautiful! We were planning on making the hike out to the abandoned plane as well- but just know they've closed it off so it's a much longer hike now! Unfortunately we didn't have time/weather on our side but this is definitely something that can be done on your way back to Reyjavik if you plan for it. We had 6 days technically however day one and six were both less than half a day- so combine them! This morning we went to the church on the hill and explored Reykjavik. It would have been perfect to do after the Blue Lagoon on Day One if we had arrived earlier! Want to book a session in this perfect country? 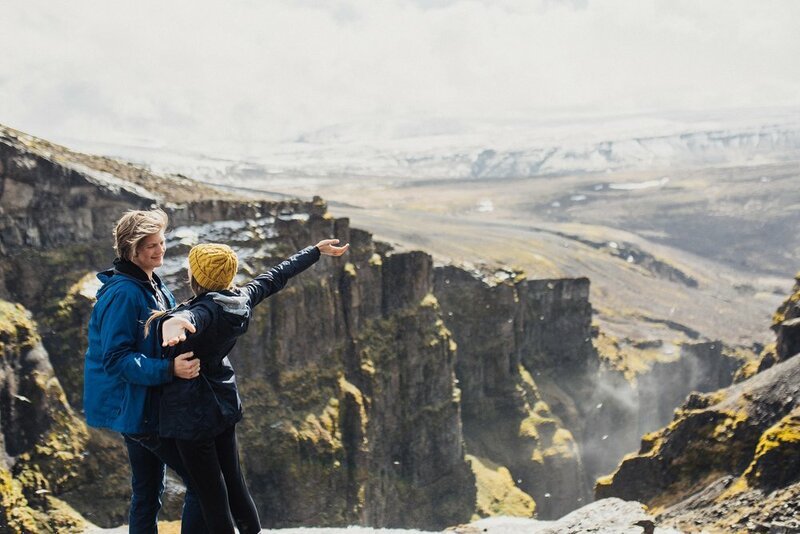 You know I'd love to document your love and elopement in Iceland.